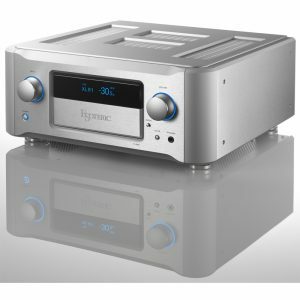 The preamplifier is a crucial component that determines the ‘sound’ of an audio system, and represents the passion and commitment of its makers. As the crowning achievement of the Esoteric Sound, the Grandioso C1 opened new horizons for ‘Made in Japan’ preamplifiers. 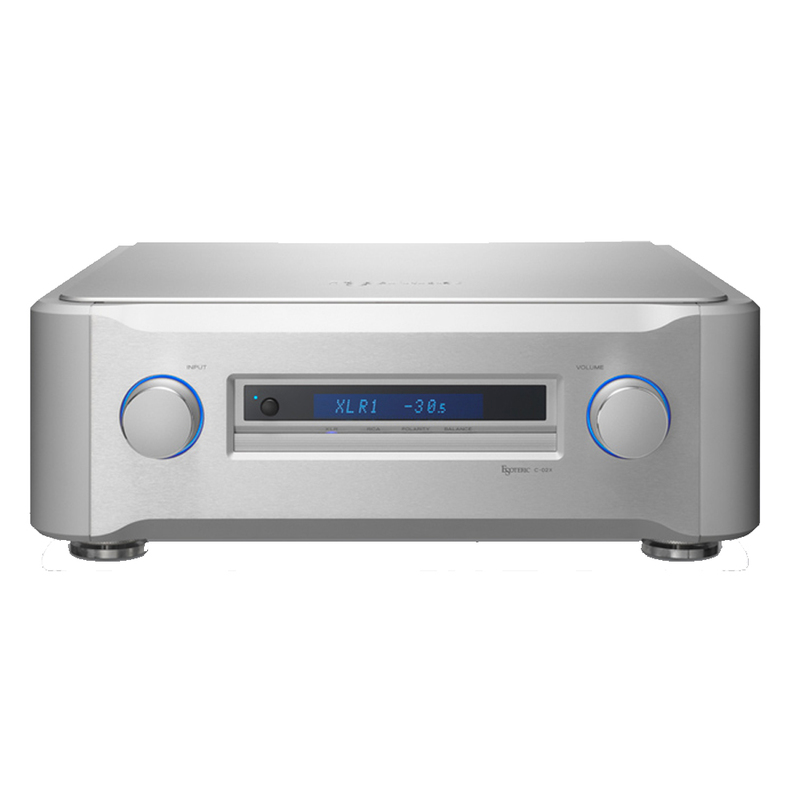 Now, this expressive power gives birth to the next-generation C-02X; a stereo preamplifier created to transcend the concept of high fidelity and resonate with the refined sensibilities of engineers and musicians alike. Audio expression, symphonic beauty, artistic passion, the concert hall’s spatial feel, the excitement of the audience. Esoteric’s Master Sound Works is an audio product concept that recreates all of the music information in original master recordings with the most state-of-the-art technology available today. Independent Dual Mono Design The C-02X’s DC power supply features a fully independent dual mono design that completely eliminates inter-channel interference. Its dedicated bank of five generously rated power transformers for each channel also blocks noise from the power line, enabling a pure, natural amplified sound. Grandioso technology reveals itself in such detailed refinements as the careful layout of the power supply circuit boards, which further contribute to the C-02X’s superb sound quality. 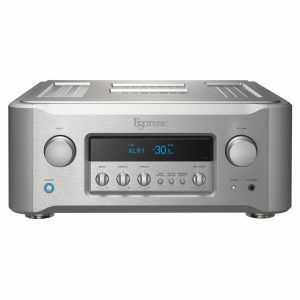 Fully-Balanced Configuration Provides Excellent S/N Ratio The preamplifier’s source signal is first received by dedicated buffer amplifiers integrated with each input, from which the circuit configuration is balanced at each stage. Through the elimination of common-mode noise and reductions in circuit impedance, a pure, noise-free signal is fed to the gain amplifiers via the shortest path possible, for an exceptionally high signal-to-noise ratio. ESOTERIC-QVCS The C-02X’s Esoteric-QVCS* volume control employs four precision switched resistor ladder networks, which change in unison as the volume knob is rotated. This arrangement allows the signal paths for the left and right channels and their positive and negative phases to be kept totally independent and as short as possible. 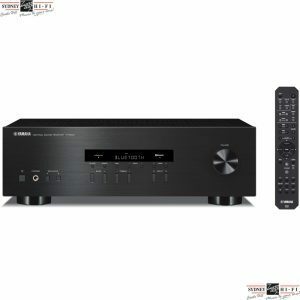 Consequently the sound has superb clarity, excellent channel separation and highly accurate phase characteristics. The elimination of audio board wiring to the volume control further contributes to a reduced signal path, while preventing degradation of sound quality and helping to maintain the low distortion one would expect of a reference model. * QVCS: Quad Volume Control System Ultra-Low-Noise Logic Control Built into the front panel, the logic control section is totally isolated, both physically and electronically, from the preamplifier module by way of an optocoupler. To assure low-noise operation, it also shuts completely down when not in actual operation, thus eliminating all possible influence on the C-02X’s audio circuitry. Highly Responsive Low-Noise, Low-Impedance Power Circuit Five independent high-capacity power transformers, coupled with large banks of reservoir capacitors, provide power supply circuits that have exceptionally low output impedances and very clean and stable outputs. The low-noise silicon carbide (SiC) Schottky barrier diodes used in the high-speed rectifier circuit further enhance resolution and the signal-to-noise ratio for significant improvements in sound quality. ESOTERIC-HCLD* Output Buffer Boosts Current Transmission While EDLC* Power Supply Ensures High Stability As a line driver, the preamplifier must be able to fully drive the power amplifiers and faithfully convey the music signal’s wide dynamic range. The key to achieving this is a circuit that provides both high current drive capability and high speed. The C-02X’s output buffer circuitry delivers an exceptionally high current drive coupled with a high slew rate of 2,000V/µs for sharp response. Independent buffer circuits for each output and symmetrical circuitry for both the hot and cold phases of the XLR outputs maximize instantaneous output current capability. Located closest to the output buffer circuitry, the EDLC* Super Capacitor array, originally developed for the Grandioso C1, was adapted as a highly stable power source. 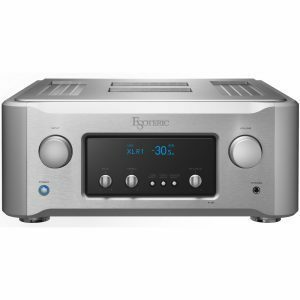 Its compact physical size belies the extraordinary 100,000µF (0.1F) capacity it provides each channel, for high levels of instantaneous output power and strong, steady bass reproduction. Integrating these two technologies, the C-02X preserves musical dynamics that would otherwise be lost if smaller current transmission levels were employed between the pre and power amplifiers, allowing it to reproduce a breathtaking level of audio reality. RCA2 terminals permit switching between normal line output and AV-through output for systems operated in both AV surround and pure two-channel modes. Optimized 3D Chassis Configuration The C-02X’s optimized chassis design features a 2-layer 5-cell configuration that houses each circuit block in its own compartment. This structure shortens the signal path to help minimize inter-circuit interference. The chassis’ 5mm-thick steel bottom plate and thick aluminum exterior panels are supported at 4 points by Esoteric’s own patented ‘Pinpoint Feet’ (patent No: JP4075477), which enhance chassis rigidity while effectively suppressing resonant vibration.